GATES POLY V 6290 Appliance Belt. H Section, 4 ribs. Metric Belt 4-PH1955, 770H4 POLY V BELT. Home > Heavy Duty V Belts > Poly-V Ribbed (Micro -V) Belts > H, PH Section Belts - 1/16" Rib Width. Industrial Poly V. > GATES POLY V 6290 Appliance Belt Replacment Durkee Atwood belt 4PH1955. GATES POLY V 6290 Appliance Belt. CLEARANCE OEM Dryer belt 162507. Durkee Atwood belt 770H4 or Metric 4PH1955. 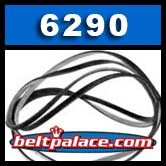 CLEARANCE: GATES POLY V 6290 Appliance Belt. H Section, 4 ribs. Metric Belt 4-PH1955, 770H4 POLY V BELT. GATES NUMBERS: 4PH1955, 6290 (Appliance belt), 770H4, GATES H040770. CLEARANCE ITEM. LIMITED TO STOCK ON HAND. NO WARRANTY, RETURNS, OR EXCHANGES. 112H4 Belt (4-PH285) Poly-V Belt. 11.2� Length. PH/H Section Motor Belt replaces appliance belts, compressor belts, drive belts, and massage chair motor belts. 112H-4 Micro-V Belt.